Something a bit different this week, as the Doctor Who Review ventures into the land of the BBC Books range of Doctor Who stories. This time around, it’s The Infinity Doctors, by Lance Parkin. There’s hullabaloo surrounding Infinity Doctors, mainly because no one knows where or if it fits into Doctor Who continuity. 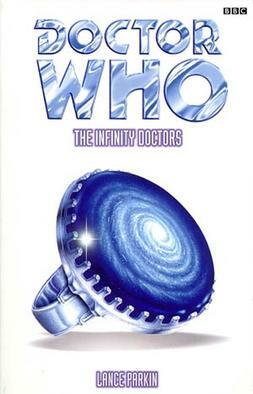 Written as a thirty-fifth anniversary tale of the Doctor, Infinity begins with a Doctor living on Gallifrey, remaining there after a life of travels, but is this a Doctor before the adventures we’ve seen him on in the TV show? An Eighth Doctor who’s settled down after a life of travel (this adventure was printed years before the New Series, with its “Last of the Time Lords” mandate for the Doctor, began)? Or is it a Doctor from a parallel universe? I like to go with the idea that it’s a Third Doctor, exiled to Gallifrey instead of Earth at the end of The War Games. The appearance, but not personal knowledge of the Sontarans and Rutan and the seemingly first battle with Omega point to this, but there’s good evidence for all of the theories, which I think is the point. It’s not an adventure of the Eighth Doctor or Third Doctor or Forty-Second Doctor, it’s an adventure of THE Doctor, the genuine article, you might say. And what a great one it is. The Doctor in this story is a different take on the character, but with all the quirks I love about the character. An element of the story that I really love is that the Doctor is a man without a planet. He doesn’t fit in on Gallifrey because travel has made him so human. He’s been contaminated by space-time travel, but he’s an asset for exactly the same reason. Only he can relate to the strange and bizarre outside of the domed Capital of Gallifrey, so the Time Lords need him. He’s the same Doctor we love, but he’s haunted by a loss, a loss that soon catches up with him. He’s a fighter and a warrior and a poet, the man we’ve come to know, but just different enough to lead us to believe that he’s been through a hell of a lot that we haven’t seen. Simply stated, he’s a perfect culmination of the character in an adventure celebrating thirty-five years of his existence. The closest thing to a companion is the Time Lady Larna, a recent graduate of the Time Lord Academy and student of the Doctor. I love her because she’s another of those great companions who stands on equal footing footing with the Doctor in terms of intelligence. She’s smart, clever, and eager to explore, all the things the Doctor used to be before his apparent house-arrest on Gallifrey. She’s not just a damsel, even when she is in distress. She’s a real character and Parkin crafts her character in a way that makes me wish we could have more adventures with the Doctor and Larna like this one. She’s another masterstroke in this novel, and I can’t gush enough about her. Originally the villain of the tenth Doctor Who anniversary story The Three Doctors, Omega returns (for the first time?) in this adventure. Parkin isn’t afraid to bring out one of the big guns of Doctor Who canon and handles him exceedingly well. The Three Doctors simply makes Omega a monster for the Doctor to fight, but Parkin makes him a genius, crafting plans and outsmarting enemies with the powers of a god. I love that the Doctor and Omega, seemingly building towards a physical and massively dangerous final battle, simply duke it out with words and logic. This, to me, clearly evidences Parkin’s understanding of the dynamic that makes Doctor Who so great. Faced with an unfathomable enemy, the Doctor gets his victory through words, not by punching or killing. It’s a great culmination, like everything else about this story, of the legacy and lessons inherent in Doctor Who. There’s a reaction I get when I open a BBC Books Doctor Who novel to find the ever-rare small print: joy. It means that a story has been barely contained in the smallest print possible to maintain the size and look of the novels. The small-print joy has proven true twice for the BBC Who novels in my experience, once with The Adventuress of Henrietta Street, by Lawrence Miles, and here with Parkin’s brilliant The Infinity Doctors. It really is a fabulous story, seer out of time. Not sure how it would read for the casual fan, but a good surface skim of a Doctor Who Wikia would fill in the blanks for you easily and quickly. The skill with which Parkin crafts his story is great and is one of those rare Who stories that perfectly fits in the novel medium. I could never imagine a TV version of Infinity, simply due to the meta-fictional material contained within the story. Parkin, like the aforementioned Lawrence Miles, seems to perfectly understand the limits and advantages of the novel format, crafting story points and villains built for the medium. Parkin’s plot is spotless, with little notes to fans and laymen alike. The cover is a beautiful, understated exception to the generally hideous work by Black Sheep. Everything about this book works and I absolutely love it. A really brilliant read. I give it five Ohms out of five. This entry was posted in Doctor Who Review and tagged bbc, doctor who, eighth doctor, forty-second doctor, infinity doctor, larna, novel, omega, the infinity doctors, third doctor, uk. Bookmark the permalink.